The Random Phase Approximation (RPA) can be used to derive a non-local expression for the ground state correlation energy. The calculation requires a large number of unoccupied bands and is significantly heavier than standard DFT calculation using semi-local exchange-correlation functionals. However, when combined with exact exchange the method has been shown to give a good description of van der Waals interactions and a decent description of covalent bonds (slightly worse than PBE). For more details on the theory and implementation we refer to RPA correlation energy. Below we give examples on how to calculate the RPA atomization energy of \(N_2\) and the correlation energy of graphene an a Co(0001) surface. Note that some of the calculations in this tutorial will need a lot of CPU time and is essentially not possible without a supercomputer. The atomization energy of \(N_2\) is overestimated by typical GGA functionals, and the RPA functional seems to do a bit better. This is not a general trend for small molecules, however, typically the HF-RPA approach yields too small atomization energies when evaluated at the GGA equilibrium geometry. See for example Furche  for a table of atomization energies for small molecules calculated with the RPA functional. which takes on the order of 3-4 CPU hours. The script generates N.gpw and N2.gpw which are the input to the RPA calculation. The PBE and non- selfconsistent Hartree-Fock energy is also calculated and written to the file PBE_HF.dat. We will start by making a single RPA calculation with extremely fine frequency sampling. The following script returns the integrand at 2000 frequency points from 0 to 1000 eV from a cutoff of 50 eV. This is the default parameters for Gauss-legendre integration. 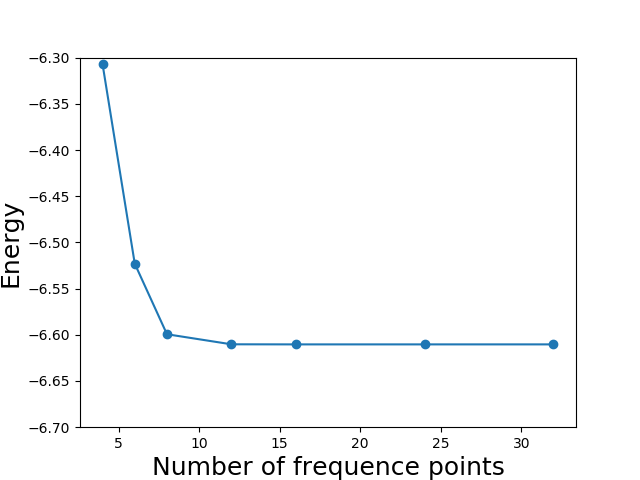 The nfrequencies keyword specifies the number of points, the frequency_max keyword sets the value of the highest frequency (but the integration is always an approximation for the infinite integral) and the frequency_scale keyword determines how dense the frequencies are sampled close to \(\omega=0\). 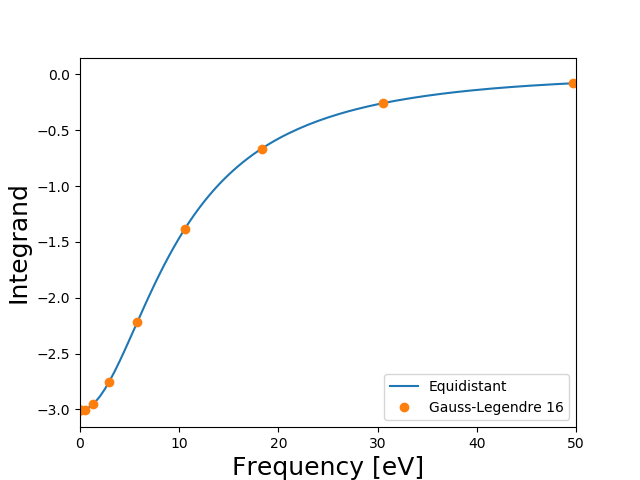 The integrals for different number of Gauss-Legendre points is shown below as well as the integrand evaluated at the fine equidistant frequency grid. It is seen that using the default value of 16 frequency points gives a result which is very well converged (to 0.1 meV). Below we will simply use the default values although we could perhaps use 8 points instead of 16, which would half the total CPU time for the calculations. In this particular case the result is not very sensitive to the frequency scale, but if the there is a non-vanishing density of states near the Fermi level, there may be much more structure in the integrand near \(\omega=0\) and it is important to sample this region well. It should of course be remembered that these values are not converged with respect to the number of unoccupied bands and plane waves. It should be noted that in general, the accuracy of RPA is comparable to (or worse) that of PBE calculations and N2 is just a special case where RPA performs better than PBE. The major advantage of RPA is the non-locality, which results in a good description of van der Waals forces. The true power of RPA thus only comes into play for systems where dispersive interactions dominate. Note that besides diagonalizing the full Hamiltonian for each distance, the script calculates the EXX energy at the self-consistent PBE orbitals and writes the result to a file. It should also be noted that the k-point grid is centered at the Gamma point, which makes the q-point reduction in the RPA calculation much more efficient. In general, RPA and EXX is more sensitive to Fermi smearing than semi-local functionals and we have set the smearing to 0.01 eV. Due to the long range nature of the van der Waals interactions, a lot of vacuum have been included above the slab. The calculation should be parallelized over spin and irreducible k-points. The calculations are rather time consuming (~ 1000 CPU hours per distance point), but can be parallelized very efficiently over bands, k-points (default) and frequencies (needs to be specified). Here we have changed the frequency scale from the default value of 2.0 to 2.5 to increase the density of frequency points near the origin. We also specify that the Gamma point (in q) should not be included since the optical limit becomes unstable for systems with high degeneracy near the Fermi level. The restart file contains the contributions from different q-points, which is read if a calculation needs to be restarted. 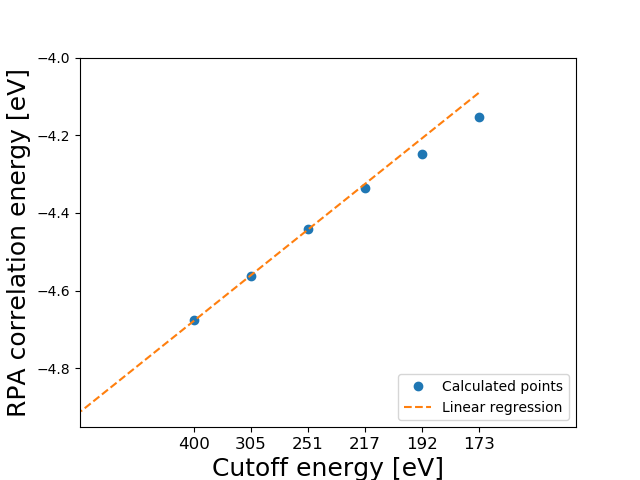 In principle, the calculations should be performed for a range of cutoff energies and extrapolated to infinity as in the example above. However, energy differences between systems with similar electronic structure converges much faster than absolute correlation energies and a reasonably converged potential energy surface can be obtained using a fixed cutoff of 200 eV for this system. The result is shown in the Figure below along with LDA, PBE and vdW-DF results. The solid RPA line was obtained using spline interpolation. 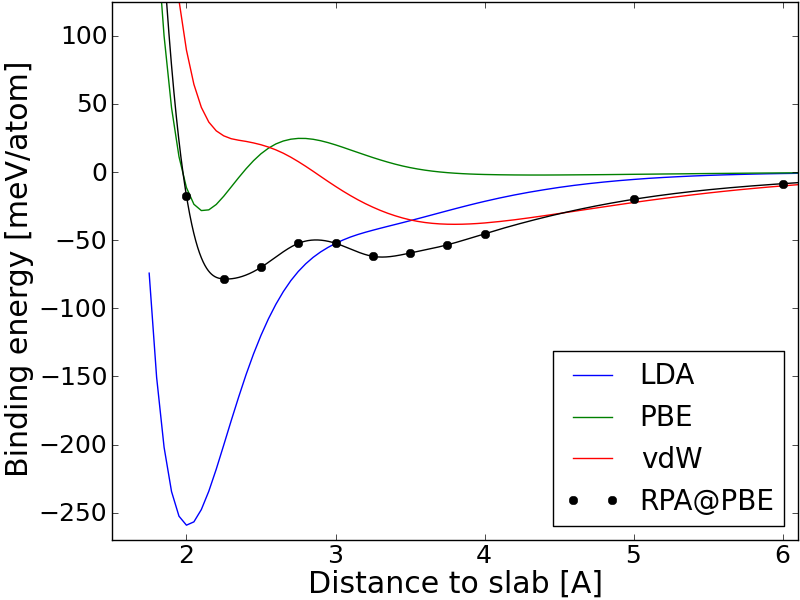 Both LDA and PBE predicts adsorption at 2.0 A from the metal slab, but do not include van der Waals attraction. The van der Waals functional shows a significant amount of dispersive interactions far from the slab and predicts a physisorbed minimum 3.75 A from the slab. RPA captures both covalent and dispersive interactions and the resulting potential energy surface is a delicate balance between the two types of interactions. Two minima are seen and the covalent bound state at 2.2 A is slightly lower that the physisorbed state at 3.2 A, which is in good agreement with experiment.